2012 marked the 30th anniversary of the introduction of the Intel 80186 and 80188 microprocessors. These were the first, and arguably only, x86 processors designed from the beginning as embedded processors. 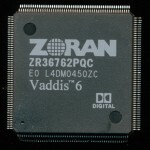 It included many on-chip peripherals such as a DMA channels, timers and other features previously handled by external chips. Initially released at 6MHz, clock for clock many instructions were faster then the 8086 it was based on, due to hardware improvements. 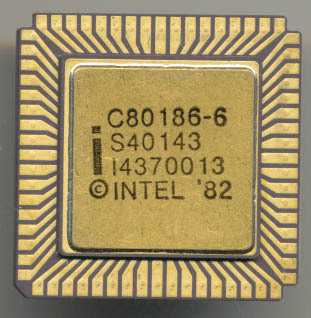 In 1987 Intel move the 186 to a CMOS process and added more enhancement including math co-processor support, power down modes and a DRAM refresh controller. Speeds were increased up to 25MHz (from the 10MHz max of the NMOS version). Through the years Intel continued to developed new versions of the 186 with added features, lower voltages, and different packages. 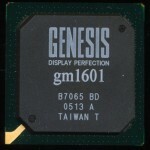 It was not until 2007 that Intel finally stopped production of the 186 series. It continued to be made by others under license including AMD, who made versions running up to 50MHz. Fujitsu and Siemens also produced the 186 series. Like the 8051 the 186 gained significant support, being embedded in millions of devices. The instruction set was familiar, debugging and development systems were (and are) plentiful so the 186 core continues to be in wide use. As IC complexity and transistor counts increased the need for a processor core that could not just be embedded into a system, but be embedded into a custom ASIC or SoC became apparent. IC’s were being designed to handle things like DVD playback, set-top boxes, flat panel control and more. These applications still required some sort of processor to handle them but having to have a separate IC for it was not economical. VAutomation (founded in 1994) designed Verilog and VHDL synthesizable cores (meaning they could be ‘dropped’ into an IC design or FPGA). In November 1996 VAutomation licensed the 8086/8, 80186/8 and the CMOS versions from Intel. This gave them them ability to design their own compatible models of these processors without fear of litigation. More importantly it allowed them to sub-license these designs to others. In 1997 VAutomation demo’d their first 186, the V186 core. This was a Intel 80186 compatible core that could be synthesized into a customers design. It was ‘technology independent which means it was not restricted to a certain process or even technology. It could be used in CMOS, ECL, 0.35u, 1 micron, whatever the client needed. On a 0.35u CMOS process it was capable of speeds in excess of 60MHz, and did so with less then 28,000 gates. 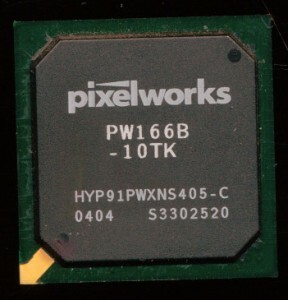 One of the first licensees was Pixelworks, which made controllers for monitors. Typical licensing was a $25,000 fee up front and royalties on a per device basis usually split into a high volume (over 500,000 units) and low volume. Typical price per chip was $0.25-$2.00, which was cheaper then the $15 price Intel was charging for a discrete 80C186. In 2000 VAutomation released the Turbo186. This was an even faster core, compatible with the Intel 80C186 (the V186 was based on the 80186). At 0.35u and 3.3V speeds over 80MHz were possible. It also included 20 and 24 bit addressing modes allowing for up to a 16Mbyte address space (as opposed to the original 16bit) greatly improving the versatility of the 80C186 design. Intel patent indemnity: The VAutomation x86 family of processors was independently developed in a “clean room” environment so technically it should have been free from the risk of patent litigation. But to further protect their customers, they also had a patent license from Intel that let them sub-license their customers to build chips that (1) use their core and (2) would otherwise infringe any or all relevant Intel patents. This removed one of the biggest risks to designers, patent infringement lawsuit, which continues to be a problem today and was certainly a concern then as Intel was busy litigating with several companies at the time. In 2002 VAutomation was acquired by ARC International, but support of the Turbo186 continued. ARC was acquired by Virage Logic, another provider of semiconductor IP in 2009. Just 8 months later (June 2010) Virage was acquired by Synopsis, one of the largest companies in the EDA (Electronic Design Automation) industry. Synthesizable cores are at the heart of embedded design today. When looking at an IC, it is near impossible to tell what processor it is based on without a datasheet as such a wide variety are available. Everything from a 65C02, to the fastest ARM cores can be easily integrated into a SoC or ASIC. So when you pick up that next bit of consumer tech, it just may have a 30 year old processor making it tick. « Repair or Replace? Not always a choice.